One thing renowned Filipino mountaineer and one-time TV host, Romi Garduce, has in spades is dogged persistence. Another I've discovered through his recently-launched book, "Akyat!" is his wry humor. In the case of the quote above, it's downright toilet humor (pun intended). This, I think, is a main draw for the book which Romi describes as "humor with misery", apart from a firsthand or what I'd like to call a "GoPro perspective" of a Pinoy mountaineer's obsession with scaling the highest peaks of the seven continents. I was still active in mountaineering (actually, a nice excuse for shooting and being outdoors) when I first heard of Romi way back in 2005. He who uses Mt. Banahaw as a daytrip training climb which we mortals hike for three days was already spoken about in some circles as part of the elite in the local climbing community. He who appears to have a cushy job that allows him these outrageously long leaves and the wherewithal to go on expeditions. He who dared dream of reaching Everest and beyond it, of peaking the seven summits. Reading this book, he turned out to be human and mortal after all. 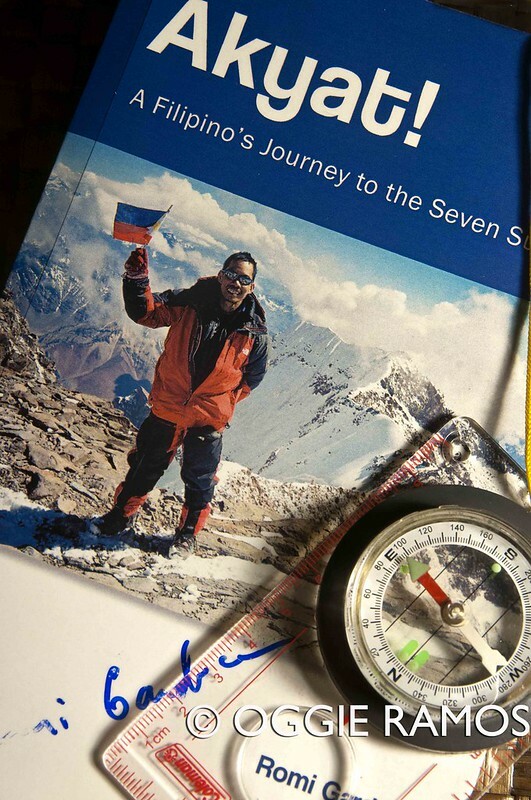 It took Romi the better of 10 years to reach all seven summits but just two days for me to journey through this book. While it feels disjointed at times, I enjoyed it. It is great not just to get into Romi's head but also his heart as he apparently didn't feel the need to hide his vulnerabilities here. "The TV program was named "Nangungunang Pinoy, sa Tuktok ng Mundo (The First Pinoy on Top of the World)." That title only meant one thing for me: pressure! Later, GMA7 removed the word nangunguna as they realized that I was not the only one attempting to summit the same mountain, in the same season. My own team wasn't in the mood for a death race... Being first was a bonus.. What I dreaded the most was the thought of becoming the first Pinoy death on Everest. Or no one reaching the summit among all of us. It was possible that that the great summit wouldn't welcome us." (perspectives on what turned out to be a network war). The book understandably dwelt longest on his Everest quest, going into details on how he first thought about it, the politicking in the mountaineering circles, and to the "circus" it became. Says he, "Not many knew that the statistical probability of reaching the summit was low, varying from 5-10 percent or depending on good weather which raised the success rate to as much as 20 percent. The death rate was one for every 10 successful summiteers. Given the low summit success rate and the probability of death, the focus on success in summiting and returning alive was more important, not the ranking. People who were rooting for a race were too dumb to know that they were encouraging a death race among Filipino climbers. I didn't want to be dragged into their circus." Points to ponder. A Filipino version. At the outset, my main observation is that the book could've been a much more engaging read if it was originally published in the vernacular. In my head, I can already imagine Romi narrating this in (much more colorful) Filipino (remembering his stint in GMA7's Born to be Wild TV series four years ago). The title alone (Akyat!) promises a colorful adventure in the vernacular. Coherence and story integrity. For the sake of coherence, I felt that the kayak and ultra-marathon adventures could've been omitted since the segments felt out of place and didn't build on the seven summits premise. I know that the book was conceived to be written and read journal-style but I felt that the subheadings can be strengthened to help the reader navigate better in between his climbs. The story is easy to read; however, the font used is not. There were very noticeable proofreading and editing gaffes such as redundancies and paragraph break errors. Forgivable really but my biggest beef is the typeface and type size used. As a regular font, it made reading already difficult; using it in italics was an exercise in visual acuity. I know Lonely Planet publish their guidebooks and books in even smaller types but LP at least uses font/s you can even read with a headlamp. Perhaps, if this is published as an e-book which I hope it will be, that can be remedied since reading on an iPad allows easy font and font size changes.